In Heroes Guard: The Journal, you are a weary and weathered adventurer. All of your questing and dungeon plundering days are behind you - but that doesn’t mean the stories of hardships and triumphs need not live on! By filling this journal with your memories you will allow some of your greatest feats… and failures… to live on. You do remember how your life story went... don’t you? 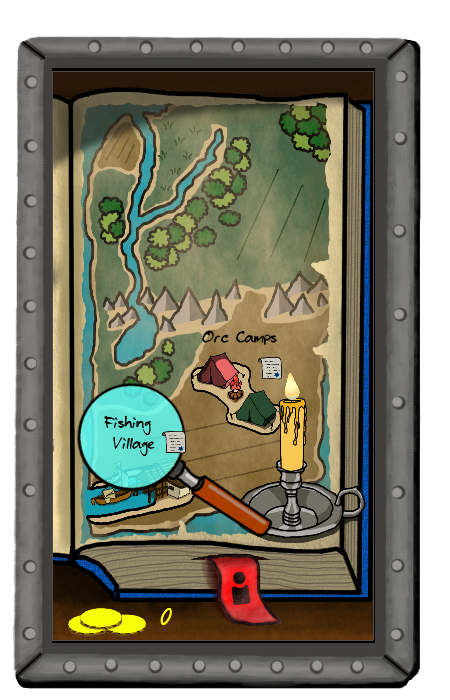 The map is updated with random events that have short stories to choose your way through. Careful - things can escalate if left unattended! Choices aren't always so simple. Your strength, dexterity, intelligence, and charisma will be challenged with a dice roll! All the skills you learned, weapons purchased, and the allies you made will be put to the test! Others won’t read about some faceless adventurer, they will read about you! Share your childhood: the type of family you had, the friends you made, and the events that made you grow into the Guardian you would become. Tell them about how and why you joined the Heroes Guard - an order sworn to provide protection and justice across the land. Being in the Heroes Guard meant that you had to unsheath your weapon and conjure powerful magic. The well-being and livelihood of those under your charge depended on your abilities. As with many of the stories you told: the outcome of each battle came down to preparation and opportunity. With each Guardian assigned several towns to patrol and serve, quick resolution was imperative. What might have started out as problem with missing livestock, would quickly escalate into the town being overrun by monstrous spiders. For those Guardians that served their patrons well, they were rewarded well. Gold, treasures, and positions of prestige are what awaited those that completed their servitude. How well did your successes in the Heroes Guard serve you?